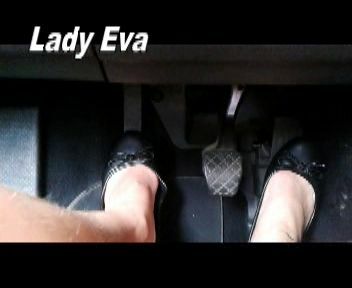 All articles tagged with "Pedal"
Lady Eva is driving through the mountains and using her feet a lot to make sure that she can make her way through the rough terrain. Her feet start to get sweaty from all of the work that she puts them through and her flats begin to open up to reveal more and more of her pretty feet. She works the clutch as well as the gas and brake the whole time. This mistress loves high heel wedge shoes. She had bought a manual sports can but she had not yet driven it using her high heels. So she decided to test it today. She wore her high heel wedge shoes and got behind the wheel. She revved up the engine and out the car into gear. She sped off while enjoying the sound of the engine and the exhaust as she disappeared in the distance. This mistress has a thing for cars. She likes sports cars and enjoys customizing them and making them speed monsters. She likes to rev and step on the gas because of the kick the car gets and how the exhaust sounds. She likes to race with other people and beats almost all of them all of the time. That is what she did with this camaro that she bought recently.